When I first started looking for a new daily driver, I really didn’t have many vehicles in mind. I was pretty set on buying a Subaru WRX Hatchback as I really wanted a hatchback that was fun to drive and AWD for the winter. I test drove a few and had one pretty much lined up to buy that checked all the boxes. That weekend I attended a local Volkswagen Dealer Car show (the same event where my old van won best in show by the way, but that’s a different story) and they happened to have a local trade in sitting on the lot. 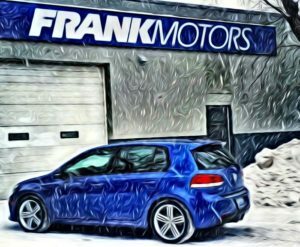 It was a gorgeous Rising Blue MK6 Volkswagen Golf R, one of less then 250 originally sold in Canada. At the time I knew a little bit about the Volkswagen R Line of Golfs as I had lusted after a MK4 Golf R32, however I knew it would be a hard car to find and, in my mind, it would be a crime to drive it in the winter. I ended up walking away from the car that day as it was a little more then I wanted to spend. I kind of hoped it would have already sold when I checked back on it the following week. To my delight and my wallets despair, the following Wednesday the car was still available. I ended up talking with the sales manager of the dealership and within a couple hours our head technician had picked up the car from the dealer and had it on our hoist for a pre-purchase inspection. I was secretly hoping to find a major issue with the car so I could easily pass on it, however that was not what we found. The car was great, no issues, great service history, and only a couple small cosmetic issues. Once the inspection was completed the time came for me to drive the car, I left saying “I’ll be back in 10 minutes”, 30 minutes later I arrived back at the shop with a huge smile on my face, it was perfect, I was sold! This was all about 3 and a half years or 40000 km ago. The car is now all mine and has truly been a pleasure to own and drive. With a 265 HP 2.0L turbo charged engine, a 6 Speed Manual Transmission, and a great AWD system the driving experience has never disappointed me, and it has never left me stuck in the snow! In the end I am glad I spent a little more money on the vehicle I truly wanted. With the car now approaching 95000 Km I am looking at my first major maintenance jobs, including a Timing belt and Intake cleaning with the shops newly acquired Walnut blasting equipment. I’m hoping by doing these maintenance items early, the car will pay me back with more years of trouble-free driving. 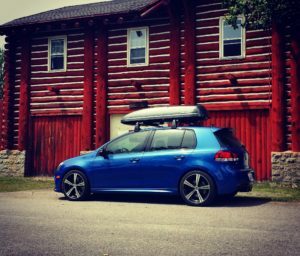 I like to maintain my vehicle like I’m going to own them forever, however I know that is most likely not going to happen with my Golf. Being a car guy, I’m always looking at what’s new to the market, and how things are depreciating along with common repair costs. I like to think/dream about my next car… a lot. 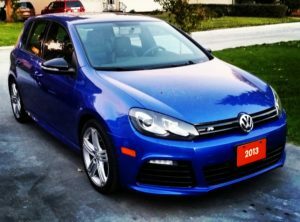 Even though I would love to find myself a Used Audi R8 V10, the Golf R has been a great affordable dream car in the meantime.